I've recently had people ask me where I shop for Campbell because they love his style. First of all, thank you for noticing and for complimenting it! I'm 100% obsessed with picking out and styling Campbell's clothes so it's nice to hear someone say they like it. 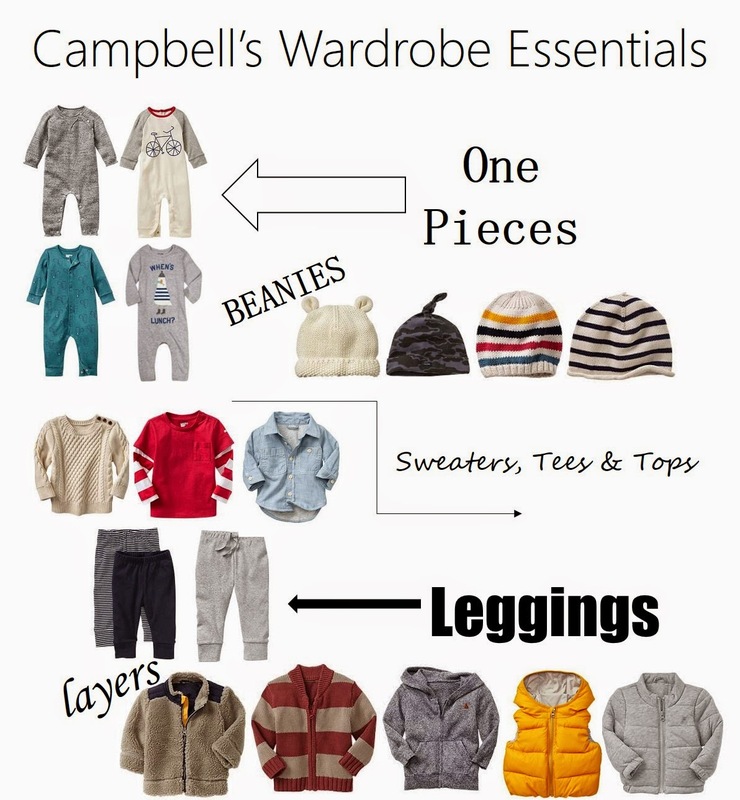 The majority of Campbell's clothes come from Baby Gap but I also love Zara Kids. Occasionally I find pieces at local boutiques but for the most part, he's a walking Gap ad. My favorite thing to put Campbell in is one pieces. They're really comfortable and I figure I can only get away with the one pieces for a short amount of time so I'm soaking it up while I can! I rarely put Campbell in onsies or jeans. We own a few but I tend to steer more towards t-shirts/sweaters and leggings. We have a few button downs and both are different shades of chambray. I love his chambray shirts. They go with just about anything and look super cute layered. Speaking of layers, yay for being able to layer now! Hoodies, cardigans, puffer vests and jackets make his outfits just that much cuter if you ask me. Of course, we always top our outfits off with beanies!! You should see Campbell's beanie collection. I did not realize how obsessed I would become with them but I have to have almost every one I see. It just pulls everything together and allows for different colors or textures to complete the look. Girls get headbands--boys get beanies. So those are our essentials! I'm not sure if there's anything more fun than dressing a baby---especially in the cooler months!